The staff of Gelli Primary have nominated their Head teacher award winners for the Spring Term. The children listed below have achieved special recognition from their teachers for outstanding contributions to school life through the term. Well done all - Llongyfarchiadau bawb. Nursery and Reception - Miss Mathias and Mrs. Davies wish to nominate the whole class for excellent work all term and in particular the Easter bonnets made for the parade. Joel Evans and Emmie Jones - for their hard work every day, always listening first time and completing their work. Lucy Thomas for showing improvement in her reading, spelling and number work. Ryan Griffiths for showing improvement in his reading and spelling work. Kadie Lane - for being kind and helpful. Jordan Gammon - for always giving 100% effort. Gabriel Adams - for excellent work, behaviour and attendance. Keeley Ward - for excellent behaviour and attitude in school. Callum Rooke - for trying his best in all subjects especially science and always being cheerful. Shauna Edwards - for being a hard working member of Year 5, always finishing her work neatly. Jessica Davies - for being an excellent role model who gives 100% in all activities. Carwyn Edwards - for making excellent progress in his assessments. After a long day of evidence gathering and interviews the staff of Gelli Primary were informed that they had maintained their Investor in People status. Employees in organisations that have achieved the Standard see benefits such as: a good working environment; recognition and development; pride in being part of a successful organisation; good quality training when required; improved job satisfaction; better communication; skill and career development opportunities; increased responsibility and involvement and health and safety gains. We in Gelli Primary School believe that to ensure the best quality teaching and learning for our children we should invest in the development of all our staff. Thank you to Mrs. Cheryl Gill Jones, our assessor for undertaking her task so professionally and assisting the staff in presenting the evidence to her. Additional thanks must go to Mrs Arlene Wilcox for the advice given in preparation for the review. Well done staff, Llongyfarchiadau. The number of children signed up for Breakfast Club at Gelli Primary has just reached the fifty mark. Many of those children who filled in forms in November have enjoyed the experience but what about the rest of you? To register just call into the admin office and ask Mrs. Thomas for a form. Please can you make sure that each child completes a form to registrer. Remember that once you are five years old you can register and attend breakfast club. What a wonderful birthday present. Come and celebrate. The following children were awarded Head teacher awards for this week. Staff at Gelli Primary School nominate two pupils who have contibuted "that little bit extra" during the previous week. This Friday Mr. Jones announced the award winners and the children were presented with their stickers by Mrs. Lee in our whole school assembly. Jamie Davies - for working hard at his treasure map. Rhydian Sparrow - for working hard on his number and shape work. Poppy Smith - for improving her speaking and listening skills in our Teaching Talking group. Josh Wigley - for always listening and undertaking tasks given. Keelan Davies - for helping Mrs. Lee with her laptop for the Smart board. Catherine Mullins - for helping Mrs. Lee in class all week. Miss Carly was attending a football tournament and will make her nominations soon. Tommy-Lee Gough - for always completing his work on time. Stephanie Exell - for excellent behaviour and attitude to work. Jack Jones and Holly Jones for working really well together in ICT by sharing their laptop. Caitlin Jones - for her enthusiasm in creating a new club. Llongyfarchiadau bawb - Congratulations everybody. The School Council and Mrs. Dyer have been busy working with the Canteen staff and representatives from Catering Direct to help us to review our school catering provision. The children devised a questionnaire which was filled in by pupils. Once the responses were analysed, the Catering Direct staff are working with us to implement the actions. There is now greater choice given each day and children who visit the salad bar have choices of baguettes and jacket potatoes. After the Easter holidays there will be a change in the timetable when children will eat lunch. Nursery and Reception children will eat at the first sitting beginning at 11.50. Then children from Year 1 and 2 along with packed lunches at miday. The second sitting for juniors will start at 12.15 with a new rota with a four weekly turnover. Week One will see year 3 dinner children and packed lunch children entering first, followed by year 4 children and packed lunch, then year 5, then year 6. The following week will be year 4's turn to be first and so on, year 5 in week 3 and year 6 in week 4 and then back to week 1. This will enure that we can give every year group an opportunity to have lunch first and that the dinner children and packed lunch children are treated equally and fairly. This should allow packed lunch children to eat at the tables again. This system will be piloted during the first month of next term with the School Council seeking views of consumers. We will keep you up to date with developments. On Thursday afternoon Nursery, Reception, Year 1 and 2 children will be invited to participate in our annual Easter Bonnet parade. If you are unsure of the arrangements please ask a member of staff for details. The Rugby squad participated in this month's rugby festival organised by Chris Jones and the Cardiff Blues Development Officers. Participating schools were - Ysgol Gynradd Gymraeg Ynyswen, Penyrenglyn Primary, Parc Primary, Treorchy Primary, Pentre Primary and Gelli. 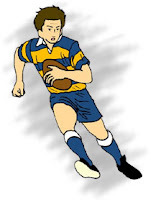 This year's squad has improved with every match and they are looking forwrd to the end of season finale - the ten-a-side touch rugby tournament in April. This tournament also includes three girls. So girls get practicing. Thank you to Mrs. Atkin, Mrs Macey and Mrs Williams for help with the traansport. A meeting of the Parents Association will take place at the Ton Pentre Football Club on Wednesday 19th March at 7.00 p.m. We need to discuss arrangements for the Summer Fate and beyond. Please will parents make every effort to support the PTA in their work by attending meetings. We always encourage our newer parents to join the association. The photographs taken by the school photographer earlier this month should return to school during the Easter holidays. They will be available for collection on receipt of £9.50 per pack and can be collected from the secretary from Wednesday onwards. If you are not happy with your photograph you may return it for a full refund. Please will all parents ensure that all dinner money owing be paid to Mrs. Thomas by the end of term. Any outstanding money has to be referred to the authority which may result in us not being able to provide your child with a meal. To avoid this situation arising please ensure that arrears are paid by Thursday morning. We are approaching the end of the Spring term which has flown this year due to the early Easter holiday. School will end on Thursday 20th March and children will be back in school on Wednesday 9th April. The staff will receive in service training on the 7th and 8th. Congratulations to Stacey Symons and Megan Atkin for representing us so admirably in the competition which was held at Treorchy Comprehensive School last night. Stacey, playing the violin, won the instrumental heat in order to represent our school against other instrumentalists. She played an arrangement of Moon River by Henry Mancini accompanied by Mrs. Griffiths, our string perepetetic teacher. Stacey didn't seem nervous as she walked confiddently on to the stage at the beginning of the competition. Stacey is currently preparing for her Associated Board Grade 2 exam. Meagn gave a beautifully crafted rendition of "Whistle down the wind" the title song from the Andrew Lloyd Webber box office hit from the West End. Megan has appeared in many lead roles during her time with us at Gelli Primary, most recently Gabriella in last summer's High School Musical production. All 27 finalists gave wonderful performances and the judges had the most difficult of tasks to narrow them down to two winners. They all received a commemarative shield, a certificate, and a trip to the Lyceum Theatre in London's West End to see The Lion King. We are very proud of their achievements not only in their performance last night but for being fantastic role models. Well done girls! Look out for another article featuring the girl's thoughts on their experiences soon. Breakfast Club is well underway with over 30 pupils receiving breakfast in the first two days. On the menu is a bowl of cereal, toast and a cup of orange juice. The year 5 and 6 boys were a little disappointed. Please will children arrive in school at eight o'clock. Breakfast is served until twenty five past eight. After this time children can play board games quietly in the hall before returning to the yard in readiness for the bell. Mrs. Alison Philip from Catering Direct said "I'm really excited that the children of Gelli Primary School can have a really healthy start to the day. I hope that more children take advantage of this initiative." Thank you to Mrs. Philip and Catering Direct for their assistance in organising this. 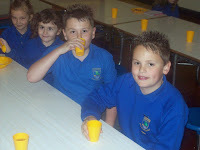 Look out for more details of breakfast club activities on this blog. Here are the list of children who were awarded Head teacher awards this week. All Key Stage One and Early Years. Congratulations to our three winners of our annual cake competition to celebrate St David's Day Shaun Walsh from Reception, Callum Lewis from Year 2 and Michael Goodwin Year 4. The winners were presented with their prizes in assembly. I am delighted to tell you that Breakfast Club will begin on Monday. Those children who have filled in forms are requested to arrive in school by 8.00 a.m. and enter the school hall via the side entrance. My supervisors will be able to explain the routines to the children during this first week. As the children will remain in breakfast club until 8.45 please can I ask you to bring in any unwanted board games or other items that may keep them entertained after they have finished eating. Bulletins will be updated on the blog. Thank you for your support for our concerts to celebrate St David's Day last week. Both concerts were very well attended and your generous donations will go to the school fund. I was very proud of the children's performances and would like to thank all the staff for their hard work in preparing the children. Diolch yn fawr! Please can I thank parents in Early years and KS 1 for your response towards the trip last week. There was some confusion regarding the request for a voluntary contribution which I will need to clarify in a specific newsletter next term. I will outline the current school policy on charging for educational visits and inform you of some new guidelines that we have received from the Welsh Assembly Government regarding off site trips. I am sure that once this information has been communicated to you any misunderstandings will be avoided in the future. Children in Gelli Primary will celebrate World Book Day on Friday 6th March by undertaking literacy activities in class, dressing up as their favourite fictional character from a book, film or television series. There will also be a book swap. Look out for an article in our local newspaper and another post on this site. Gelli Primary School is launching a new inovation. a blog where the latest information about school activities will be posted for viewing. This service will be developed as the term progresses. We would welcome constructive feedback from readers.